Volume 11, Issue 4, 2016 with permission of Kluwer Law International. As in many of the other nations who are parties to the Trans-Pacific Partnership Agreement (TPP), the negotiations leading to agreement on the TPP and its subsequent announcement evinced some widely divergent views in Australia. These views ranged from the ‘fear and loathing’ position to the ‘welcome with open arms’ position between which is a large proportion of the population who have little idea on what the TPP means and generally do not care – as has been the case with all of Australia’s Free Trade Agreements (FTA). However, even within that largely disinterested group, there is an increasing level of concern in Australia with some elements of the TPP and the wider FTA agenda more generally which I will discuss in more detail below. The purpose of this article is to provide the briefest of summaries of the Australian FTA agenda generally, how the TPP fits into that agenda and how it will be endorsed and implemented in the Australian context, including how that implementation could be improved compared to what has happened with other Australian FTA. In a number of instances, articles on trade and legal developments are written from an academic ‘distance’. In this case I thought it would be dishonest for me to do so. I am a director of the Export Council of Australia (ECA)1 with responsibility for Trade Policy as well as a director of the Food and Beverage Importers of Australia (FBIA)2 and both organizations have been active and vocal proponents of Australia’s Trade Policy and FTA agenda. In fact, in my ECA capacity I appeared in a number of TV and radiointerviews to discuss the TPP in which I was positive as to the opportunities arising from the TPP. I have expressed similar views in articles in the print media as well as in my own articles and in submissions and appeared before a number of Parliamentary Committees considering aspects of Australia’s FTA agenda. I am also a member of a number of consultative bodies established by government agencies to address legal, compliance and practical issues which touch on trade and our FTA agenda. This has brought me into contact with many from government responsible for negotiating the FTA who I respect and admire (and like!). Professionally, I act for a number ofclients who are importers, exporters and service providers in the supply chain who will benefit from the TPP. That said, I am by no means blind to the shortfalls in the TPP and other FTAs. I have been actively engaged in work to improve their implementation and defend those whose use of the FTAs may not have been perfect and whoare facing compliance and enforcement action by the border agencies. I have also been an opponent of the increase in legislation and practices adopted here in our anti-dumping and countervailing regime which have the appearance of being biased towards Australian industry against the legitimate interests of overseas exporters, their Australian importers and Australian consumers who pay more than would otherwise be the case for goods subject to those Trade Remedies.However, all things considered I believe the positives of the TPP far outweigh any negatives both for now and into the future. It is certainly the high watermark of Australia’s FTA agenda to date.So, I would now wish to turn to the Australian TPP experience. The Australian Federation has been in place for 115 years, for about half of which time Australia adopted a largely protectionist approach to trade policy.It has only been of relatively recent time that we have embraced a more open trade policy. That has significantly escalated in the last few years. • That Australia would not secure many benefits through the TPP as a relatively minor trading nation compared to the other nations. That reflected some ongoing unhappiness over the perceived lack of gains under the AUSFTA, especially from those in the Australian agricultural industry. • That the sheer complexity of the deal would detract from the ability to secure any potential benefits. • The suspicion that the negotiations were deliberately being conducted in secret without the release of negotiating text meaning that there was something to hide. Those concerns escalated when agreement on the TPP was announced without the release of the text. • The alleged absence of useful and effective consultations. • That the US would overwhelm the Australian opposition to the US position on intellectual property, especially in the pharmaceutical arena with the effect that US Biologics would be granted a longer term of IP protection than that which would otherwise be afforded in Australia, causing an increase in healthcare costs. • It would allow the unrestricted sale of Australian property and other assets to corporations in other TPP nations with the effect that Australia would ‘no longer be for Australians’. • It would seriously undermine the position of Australian workers by allowing lesser-paid skilled workers in other TPP nations to more readily secure visas come to Australia. Many of these arguments and concerns had been expressed in the context of other proposed FTA, most particularly during the political and legal debates over ChAFTA. The responses to these concerns were predictable yet also legitimate. Many of us pointed to the fact that there had, in fact, been extensive consultation on the TPP, that the absence of the negotiating text was consistent with past practice, that an ISDS provision was a legitimate concession to secure the TPP but would be carefully negotiated, that we would ‘hold the line’ on IP protection for Biologics and, importantly, that any decision to depart from negotiations would be a disaster for the remainder of our FTA agenda so that not being in the TPP would be far worse than being in a reasonable although modest TPP. There was a degree of surprise when the final announcement on agreement on the TPP was made. There had been significant speculation that the deal would be struck and announced after the Ministerial meeting in Maui and the failure to reach agreement there was seen as a sign that the deal could not be done in any circumstances. The subsequent meeting was seen as adesperate measure by the opponents of the TPP and others held no optimism that it could be successful. In some ways, the announcement of a deal having been clinched blind – sided a number of parties – which could explain why the media resorted to dragging me in for comment. The public announcement of the TPP and its ‘highlights’ received responses from Australian interests which followed their previous positions. The absence of a completed text attracted some adverse comment and fed into the conspiracy theories which swirled around the deal and was supported by the lengthy delay between announcement of ChAFTA and the eventual release of its text. My response to that particular conspiracy theory came from many years of legal practice – that given the last minute negotiations, the text was probably covered in hand – written amendments, yellow sticky notes and emoticons and it would take some time to reduce to proper and correct form. • The mere completion of the TPP was cause for celebration as it included many of our major trading partners with whom we had FTAs and delivered improvements in our existing deals with those partners. • That it improved outcomes with countries with which Australia already had FTA. • That it effectively delivered FTA with Mexico and Peru (with whom we did not have any deals) and significant new outcomes in our deal with Canada. • The TPP was, in itself, an achievement and also set a framework for future improvements, such as the admission of other nations, potentially including South Korea and China. • The regional nature of the deal would deliver real benefits in cumulation of work across the region and was not merely about the US. For example, significant outcomes had been negotiated to accelerate commitments to Australia by Japan and Korea under our JAEPA and KAFTA. • The completion of the deal would place pressure on other nations outside of the deal to accelerate their own deals and further improve the trading environment. • While some of the improvements in market access issues may have appeared to be relatively minor they were, in reality, significant. For example, our sugar industry did not get the significant increase in benefits for which it had hoped but ultimately the TPP delivered a doubling in market access which brought us up to and equal to the rights of any other country including Brazil. • The concession on the ISDS was subject to valid limits and a rigorous regime which should assist against abuse or the types of ‘compensation’ actions which concerned many parties. Particularly there was a specific ‘carve out’ which protected against ‘tobacco litigation’. • The inclusion of a provision to advance the interests of Small and Medium Sized Enterprises (SME) for the first time in an FTA. • Significant advances in the chapters aiming to protect against the adverse competition effects of State – Owned Enterprises and on e-commerce which supported many contemporary trade initiatives. • New opportunities for the energy and resources sector including in oil and gas exploration and the export of Mining Equipment, Technologies and Services. • Enhancement of the markets for services exports across the TPP countries. • Introducing consistency and reducing regulations across the countries. • Significant new commitments on government procurement and environmental protection. • Improved transparency on customs procedures and new measures to address non-tariff barriers which become so much more important as duty rates are reduced. The recent release of a review of the TPP by the World Bank has led to some adverse comment especially in the headline comment that it would ‘only’ deliver a 0.7% improvement to Australia’s GDP by 2030.22 However, even then, there are some recognized limits to that review and it also discloses more significant benefits to other participants which, of themselves are invaluable to the region. In any event, “only” a 0.7% increase is still significant. Ultimately, being in the TPP is a superior outcome than being outside the TPP and the advantages will only increase over time. • Following signing in New Zealand on 4 February 2016, the TPP has been submitted to the Joint Standing Committee on Treaties (JSCOT) for review together with a National Interest Analysis.23 JSCOT only reviews and does not ‘pass’ the TPP but its views and recommendations will be watched carefully as a positive report will assist the approval process. • The TPP will no doubt be subject to review by other Parliamentary Committees in particular those in the Senate dealing with defence, economics and law. • Legislation and regulation needed to implement the TPP will need to be passed by Parliament. Usually this includes changes to tariff rates and documentary requirements for the claim of preference under an FTA, the increase in investment thresholds before approval is required and, potentially, changes to our migration regime. This process does permit extensive scrutiny and comment by interested parties and the public more widely. It also allows for extensive political engagement and pressure as that legislation needed to pass Parliament needs to pass both Houses of Parliament and where the government of the day may not control the Senate (our upper house of Parliament). This often requires some sort of political ‘deal’ to ensure the legislation is passed as was the case with our recent ChAFTA where controversy over the labour market provisions required passage of changes to our migration regime to ‘protect’ local skilled employment. Now that the process has started and hearings have started at JSCOT, we are beginning to get a better view of the compromises which which may be required in Australia to secure public and political approval for the ratification of the TPP. I have already drafted submissions for the ECA and the FBIA and representatives of the service providers in the supply chain will be makingsubmissions. I look forward to that process including appearing in person before many Parliamentary committees of inquiry. There is no set time frame for this Australian process but I would anticipate about six months. Of course, we then need to await the ratifications of the other TPP parties which may prove to be the more difficult task. The delay and uncertainty can also have the ‘knock on’ effect that those in the supply chain may not take the time to prepare for the TPP until late in the international process which would trigger commencement of the TPP. The busy Australian FTA agenda with a number of deals likely to be completed in the first half of 2016 may well turn attention (and preparation) away from the TPP. From the perspective of the ECA, the FBIA and those in the supply chain (including my clients), the implementation of FTA often poses the most problems, especially at commencement. The recent commencement of the ChAFTA has created all manner of practical issues as information was not available on practical border issues until shortly before commencement and there has been evidence of differences of opinion on rules of origin andcertificates of origin. This has not been assisted by comments from the Australian border agencies that they expect a higher level of strict compliance with the ChAFTA and border legislation requirements than may be reasonable to expect, especially in the short term when compared to the actual provisions of the ChAFTA which suggest a more ‘forgiving’ approach to compliance with ChAFTA. Which is why I would reiterate, again, what Ihave included in submissions on other FTA that there be comprehensive engagement on TPP implementation as early as possible to allow for those in the supply chain to properly prepare for implementation matched with asympathetic approach to compliance which does not penalize or prosecute inadvertent breaches of border law. In fact, I would strongly recommend a moratorium on penalties for inadvertent breach of the law for a six-month period as we had with the AUSFTA.We live in interesting times and I seriously hope that the potential FTA ‘fatigue’ and lack of resources to agencies in implementing the TPP do not detract from its significant benefits. 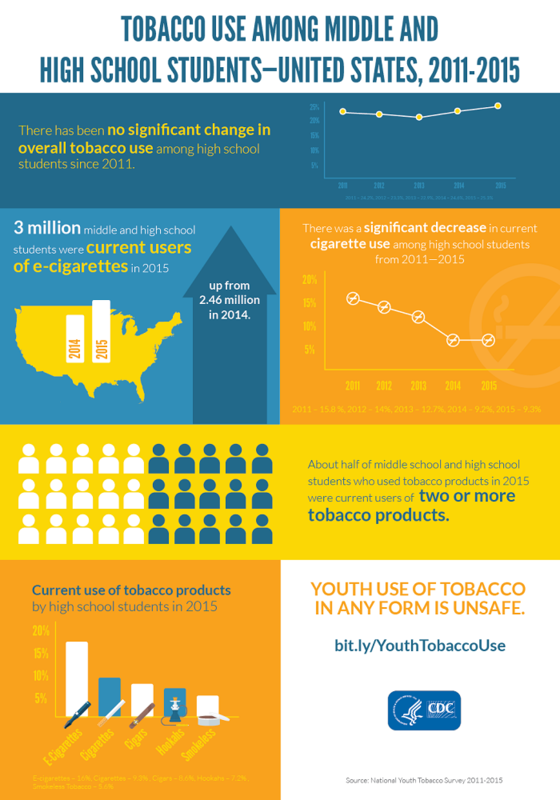 Preventing tobacco use among youth is critical to ending the tobacco epidemic in the United States. In 2014, 73% of high school students and 56% of middle school students who used tobacco products in the past 30 days reported using a flavored tobacco product during that time. About 2 of every 100 middle school students (2.3%) reported in 2015 that they smoked cigarettes in the past 30 days—a decrease from 4.3% in 2011. About 9 of every 100 high school students (9.3%) reported in 2015 that they smoked cigarettes in the past 30 days—a decrease from 15.8% in 2011. About 5 of every 100 middle school students (5.3%) reported in 2015 that they used electronic cigarettes in the past 30 days—an increase from 0.6% in 2011. 16 of every 100 high school students (16.0%) reported in 2015 that they used electronic cigarettes in the past 30 days—an increase from 1.5% in 2011. 2 of every 100 middle school students (2.0%) reported in 2015 that they had used hookah in the past 30 days—an increase from 1.0% in 2011. About 7 of every 100 high school students (7.2%) reported in 2015 that they had used hookah in the past 30 days—an increase from 4.1% in 2011. Nearly 2 of every 100 middle school students (1.8%) reported current use of smokeless tobacco. 6 of every 100 high school students (6.0%) reported current use of smokeless tobacco. “Current use” is determined by respondents indicating that they have used a tobacco product on at least 1 day during the past 30 days. Tobacco product types include cigarettes, cigars, hookahs, snus, smokeless tobacco, pipes, bidis, dissolvable tobacco, and electronic cigarettes. “Use” is determined by respondents indicating that they have used a tobacco product on at least 1 day during the past 30 days. †”Any tobacco product” includes cigarettes, cigars, smokeless tobacco (including chewing tobacco, snuff, dip, snus, and dissolvable tobacco), tobacco pipes, bidis, hookah, and electronic cigarettes. §Where percentages are missing, sample sizes were less than 50 and thus considered unreliable. The way mass media show tobacco use as a normal activity can promote smoking among young people. Youth are more likely to use tobacco if they see that tobacco use is acceptable or normal among their peers. Parental smoking may promote smoking among young people. There is evidence that youth may be sensitive to nicotine and that teens can feel dependent on nicotine sooner than adults. Genetic factors may make quitting smoking more difficult for young people. A mother’s smoking during pregnancy may increase the likelihood that her offspring will become regular smokers. Continued efforts are needed to prevent and reduce the use of all forms of tobacco use among youth. U.S. Department of Health and Human Services. The Health Consequences of Smoking—50 Years of Progress: A Report of the Surgeon General. Atlanta: U.S. Department of Health and Human Services, Centers for Disease Control and Prevention, National Center for Chronic Disease Prevention and Health Promotion, Office on Smoking and Health, 2014 [accessed 2016 Apr 14]. U.S. Department of Health and Human Services. Preventing Tobacco Use Among Young People: A Report of the Surgeon General. Atlanta: U.S. Department of Health and Human Services, Centers for Disease Control and Prevention, Office on Smoking and Health, 1994 [accessed 2016 Apr 14]. U.S. Department of Health and Human Services. Preventing Tobacco Use Among Youth and Young Adults: A Report of the Surgeon General. Atlanta: U.S. Department of Health and Human Services, Centers for Disease Control and Prevention, National Center for Chronic Disease Prevention and Health Promotion, Office on Smoking and Health, 2012 [accessed 2016 Apr 14]. Centers for Disease Control and Prevention. Flavored Tobacco Product Use Among Middle and High School Students—United States, 2014. Morbidity and Mortality Weekly Report, 2015;64(38):1066–70 [accessed 2016 Apr 14]. Centers for Disease Control and Prevention. Tobacco Use Among Middle and High School Students—United States, 2011–2015. Morbidity and Mortality Weekly Report, 2016;65(14):361–7 [accessed 2016 Apr 14]. Centers for Disease Control and Prevention. 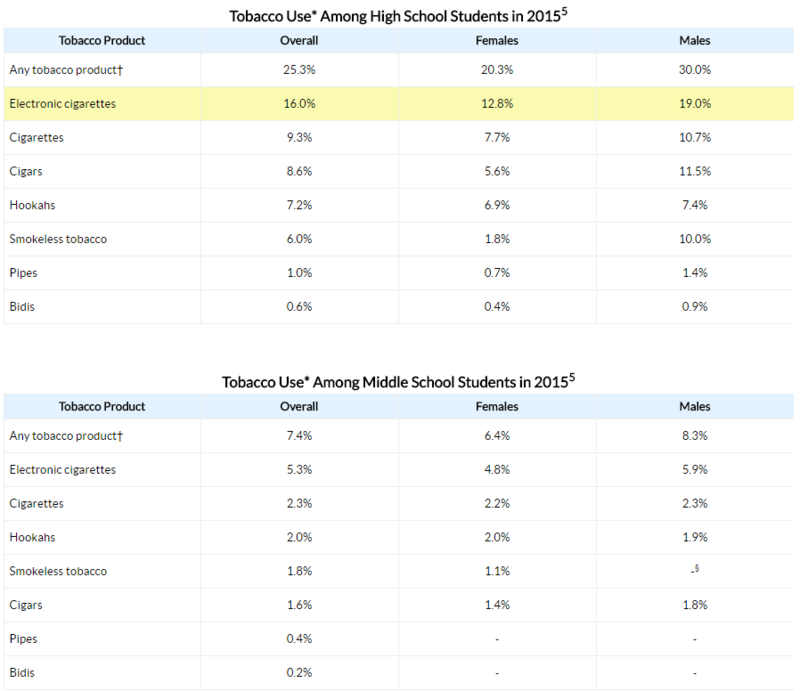 Tobacco Product Use Among Middle and High School Students—United States, 2011 and 2012. Morbidity and Mortality Weekly Report, 2013;62(45):893–7 [accessed 2016 Apr 14]. Centers for Disease Control and Prevention. Tobacco Use Among Middle and High School Students—United States, 2013. Morbidity and Mortality Weekly Report, 2014;63(45):1021–6 [accessed 2016 Apr 14]. U.S. Department of Health and Human Services. Reducing Tobacco Use: A Report of the Surgeon General. Atlanta: U.S. Department of Health and Human Services, Centers for Disease Control and Prevention, National Center for Chronic Disease Prevention and Health Promotion, Office on Smoking and Health, 2000 [accessed 2016 Apr 14]. Centers for Disease Control and Prevention. Combustible and Smokeless Tobacco Use Among High School Athletes—United States, 2001–2013. Morbidity and Mortality Weekly Report, 2015;64(34):935–9 [accessed 2016 Apr 14]. Centers for Disease Control and Prevention. Best Practices for Comprehensive Tobacco Control Programs—2014. Atlanta: U.S. Department of Health and Human Services, Centers for Disease Control and Prevention, National Center for Chronic Disease Prevention and Health Promotion, Office on Smoking and Health, 2014 [accessed 2016 Apr 14]. King BA, Jama AO, Marynak KL, Promoff GR. Attitudes Toward Raising the Minimum Age of Sale for Tobacco Among U.S. Adults. American Journal of Preventive Medicine 2015. E-pub ahead of print: DOI: http://dx.doi.org/10.1016/j.amepre.2015.05.012 [accessed 2016 Apr 14]. Does Tobacco Violate Human Rights? The Inter-American Commission on Human Rights (IACHR) recently heard testimony from experts on why tobacco should be considered a human rights issue, according to a press release from Action on Smoking and Health, the nation’s oldest anti-tobacco organization. The thematic hearing, held at the Organization of American States (OAS), was the first time the Commission has formally considered tobacco in its work. Tobacco continues to be the number one cause of preventable death in the world, killing about 6 million people per year and causing incalculable disease and economic costs, the release noted. Expert witnesses from three groups-Action on Smoking and Health (ASH US), the InterAmerican Heart Foundation (FIC Argentina) and the O’Neill Institute at Georgetown University Law Center-argued that the failure of governments to curtail tobacco industry practices such as marketing to children and interfering in public health policy amounted to a violation of obligations under several human rights treaties. The solution, according to the panelists, is the full implementation of the World Health Organization Framework Convention on Tobacco Control (FCTC), a global treaty which has been joined by nearly every country in the Americas. The United States is one of the few holdouts. Panelists focused in particular on the corruptive practices of the tobacco industry in pushing cigarettes, which kill half of long term users, and advertising that is often aimed at women, young people, children and vulnerable groups. • Recognize that the tobacco industry has developed aggressive strategies that hinder the effective exercise of the right to health. • Track and include the issue of tobacco control in all lines of work of the Unit on Economic, Social, and Cultural Rights. CLEVELAND, Ohio — Beginning today, smokers under the age of 21 are no longer legally able to buy cigarettes, tobacco or other smoking products, including electronic cigarettes, in the city of Cleveland. An ordinance, passed by City Council in December and taking effect today, bans the sale or distribution of the products to young adults, in the hopes that increasing the minimum sales age from 18 will disrupt the supply to children and teens. The new restrictions apply only to vendors who sell tobacco and smoking products, and not to consumers. Under the ordinance, a first offense is a fourth-degree misdemeanor, punishable by up to 30 days in jail or a $250 fine. Subsequent offenses are second-degree misdemeanors, which could carry a 90-day jail sentence. Experts testified before Cleveland City Council that the new law will disrupt the supply of cigarettes and tobacco to teenagers and adolescents. Council members said in December that they would prefer the city’s Health Department take the lead on enforcement, rather than police. And Council President Kevin Kelley said at the time that council could revisit that issue and propose amendments in the 120 days before the law took effect. Kelley acknowledged this week, however, that council moved on to other issues and did not circle back to the ordinance to answer that question. City spokesman Dan Ball said Thursday that the city will continue using the same enforcement method it used when the minimum buying age was 18. Health inspectors will report to police any tips, suspicious activity or concerns based on information gathered during scheduled inspections, random check-ups or from the public. Police then follow up with inspections or undercover buys, Ball said. Public health experts testified at council hearings that such laws work because young adults between the ages of 18 and 20 make up only two percent of cigarette sales — but represent 90 percent of the suppliers to kids under 18. Increasing the legal buying age would naturally interrupt the supply to teens, experts said. But the ordinance stirred controversy among the city’s business owners, who argued during council hearings that it will create unfair competition between store owners who will follow the law and those who won’t. They stressed that more devastating than losing the cigarettes sales would be losing the revenue from the other items that smokers buy while in the stores, such as sandwiches, snacks and groceries.